The plot below is the real yields. I didn't see an easy way to update the color bar, so read the '10' and '-10' as '>=10' and '<=-10'. Those are all percentages. To read it, simply pick a row for your starting year, and read-left to right to see how the investment performed. For example, if you start at 1928, then 1928 is 1 year, 1929 is 2 years, etc. 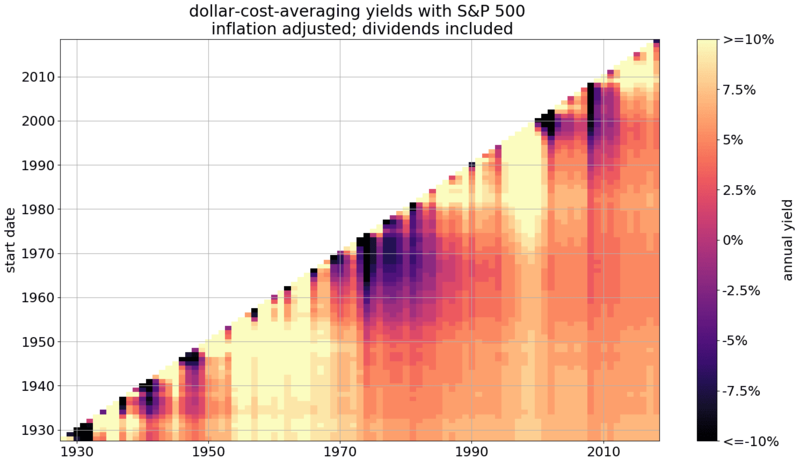 If you start at 1966 and check 1995 and see a value of 4.6%, that means that the real yield if you invested steadily for 30 years starting in 1996 is 4.6%. Hovering lets you see more detailed info. Read below the plot for methodology. The value in the plot is just the rates from steps like #4. Those values are the approximate annual yield of the investment factoring in dollar-cost averaging, inflation, and dividends.